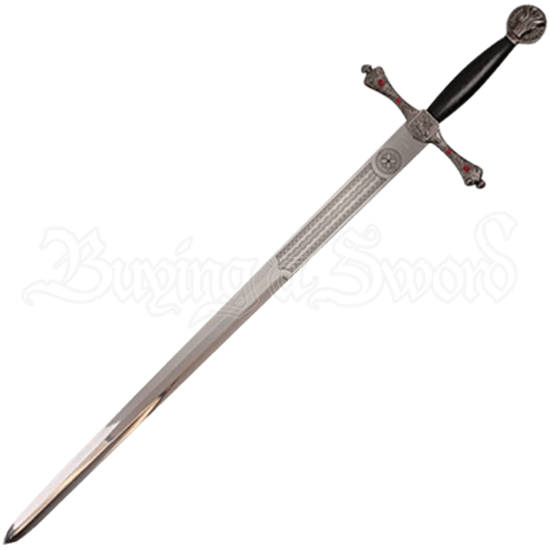 A regal interpretation of a knights blade, the Medieval Griffon Sword with Sheath is a high quality, stainless steel display weapon with Celtic themed etching along its ricasso and an ornate, silver tone crossguard and pommel. This beautifully detailed replica sword has a round pommel adorned with a fleur detail that is further surrounded by twists and knotwork. The black handle is subtly contoured to better fit the grip of a wielder. Surrounded by ornate scrollwork, a griffon emblem appears at the center of the crossguard. The straight arms are elegantly curved and feature small red gemstones, lending a sense of regality to this decorative weapon. Black to match the handle of the sword, the included sheath also displays ornate metal detail on its throat and endcap. 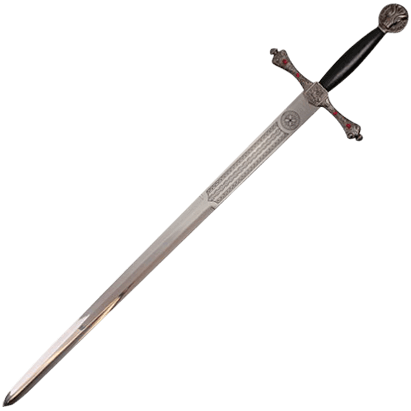 A remarkable addition to any weapon collection, this medieval replica sword makes a great gift or decoration for those intrigued by the weapons used in the Middle Ages.